The Era of True Healing is Here. Become Happy Through the Subtraction Method of Maum Meditation and Maum Talk Concert. Throwing away the human mind that is false and changing it to the universe mind. Maum Meditation offers “healing” for people who are exhausted from this busy competitive society and is drawing much interest from all parts of the world. Although many are wealthy materially, their inner selves have gradually become suppressed and people search for relief from stress and anxiety. 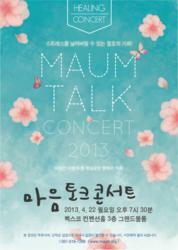 MAUM Talk Concert offers an authentic “subtraction of the mind," the true healing method for many people which is taking place successfully in South Korea. A series of 17 concerts was held all over South Korea over a 32 day period from March 25 - April 25, 2013 with future concerts possibly in the works. Depending on the venue, the concerts drew large crowds near or at times over capacity ranging from 1,000 to 3,000 people, demonstrating that the true healing of the mind is what people are opting for over entertainment alone. Much of society lives in stress, unaware of its cause or the true nature of the mind. A relatively new concert format in South Korea, the talk concert, is causing a sensation as it introduced the audience to exactly what the mind is and presented the method on how to subtract the mind to find one's true self. In addition, various artists were invited to the concert so that the audience could enjoy at the same time entertainment as well as a healing of the mind and a soothing of the soul. There were fusion musical performances with traditional Korean instruments alongside piano and base guitar in addition to tranquil folk songs accompanied by acoustic guitar, and an enjoyable play to help the audience understand further what Maum Meditation is about. The host of this event, Yu Jin Woo, is a play and performance artist who was formerly a professor at Ecole Internationale de Jacques Lecoq and is now the Vice President of the Institute of Human Completion. Yu commented, "MAUM Talk Concert provides warmth to one's mind and soul like a spring day and that such a performance would be especially helpful as everyone leads a busy life these days." Also, Instructor Park Yu Dae who has been instructing this method for more than a decade lectured simply but in detail about Maum Meditation: Throwing away the human mind that is false and changing it to the universe mind. With the audience paying close attention to his lecture, Instructor Park further presented the definition of the mind, the problem, and solution. MAUM Talk Concert has been causing a huge sensation in the wake of this newly launched concert genre, which has been reinforced with an element of the healing one’s mind. It is seen as a unique event as it is not limited to just entertainment but also encourages people to let go of their stress and heavy burdens. Founded in 1996 by Woo Myung, and located worldwide with more than 340 centers and over 400,000 people having practiced the method, Maum Meditation is already a sensation across many continents. Maum Meditation is a simple 7-step method of subtraction that allows one to become free of the stressful mind by changing the human mind to the infinite universe mind and includes a variety of programs, including youth camp, university student camp, teacher’s training course, business training and Mind Coaching Center. Teacher Woo Myung is also the best selling author of numerous books. His latest, "Stop Living In This Land, Go To The Everlasting World Of Happiness, Live There Forever" was a #1 Amazon Best Seller in November 2012. This book was also named as a finalist for the Montaigne Medal in April 2013. The e-book version was awarded three Gold awards for the eLit Awards for the categories of Inspiration/Spiritual, New Age/Mind/Body/Spirit, and Self-Help also in April 2013.